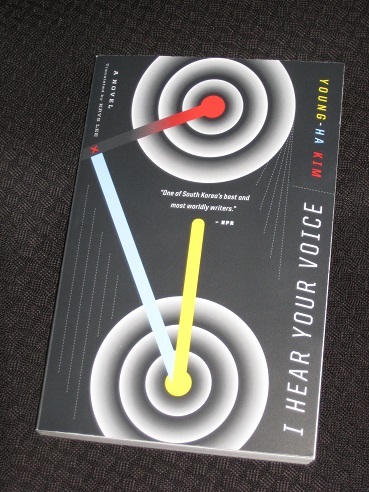 I Hear Your Voice (translated by Krys Lee, review copy courtesy of Mariner Books) focuses on the lives of Jae and Donggyu, two boys growing up in the Korean capital. Despite coming from very different worlds, their paths cross when Jae and his adoptive mother move into one of the flats owned by Donggyu’s family. The boys make an instant intimate connection, but events conspire to separate them, with Jae eventually ending up in an orphanage. Jae’s sunken eyes became shiny and glowed with an otherworldly energy. This gift is what sets him apart, and when he decides to join the bikers in their nightly gatherings, people come to hear him speak. His favourite book, Herman Hesse’s Siddhartha, guides his path, and we sense that the Christlike parallels in Jae’s story are no coincidence. The character of Donggyu provides another side to the novel. A fairly normal middle-class kid, he’s intrigued by what he sees when he re-enters Jae’s world, and we get to experience it through his eyes. It’s a glimpse of the other Korea, the streets you don’t see in K-Dramas, with nightclub dancers and pizza delivery boys scrambling to make it to their destination in thirty minutes (otherwise, they don’t get paid…). As we take to the nighttime streets, we must be wary of the truck drivers speeding through the night, doped up on pills to help them avoid sleep – and then, of course, there are the biker gangs. It’s a matter of reclaiming the streets and putting fear into the hearts of the ‘normal’ people, and that’s exactly what they plan to do. When the sun goes down, the downtrodden fight back, taking the streets from the rest of society. The first book that came to mind after reading the first part of I Hear Your Voice was Ryū Murakami’s Coin Locker Babies, a novel that also follows a couple of boys growing up on the mean streets of a big city, but this one has all the hallmarks of Kim’s work. He manages to skilfully blend the first person anecdotes, descriptions of Jae’s life and the narrator’s comments, with the sudden introduction of another main character half-way through (a policeman who is presented as Jae’s alter-ego,or nemesis) bringing a welcome change of pace. Kim also manages to contrast the fates of the two main characters; as Jae’s fortunes rise, Donggyu begins to lose status, and this will have consequences for the dramatic climax, when thousands of bikers take to Seoul’s streets to face off with the police. As was the case with I Have the Right to Destroy Myself, there’s a wonderful mixture of rather unpleasant scenes with excellent writing, pulling the reader onwards through Jae’s story, and luckily the English-language reader is able to experience it all.